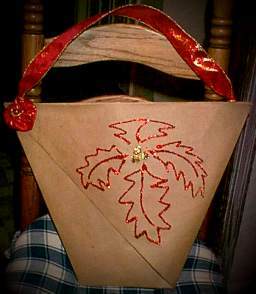 Several years ago, one of my two sister put her gifts in gift bags that she made from brown paper grocery sacks. I took one apart to find out how it is done and here are the instructions. These instructions will produce a bag that is roughly 12 inches tall. optional: Trinket to hang off of the handles. Cut a 30 inch square from heavy paper. My sister used a brown sack paper, I used kraft paper; any heavy paper will do, even wallpaper scraps if it is wide enough. You will fold over two opposite corners next. 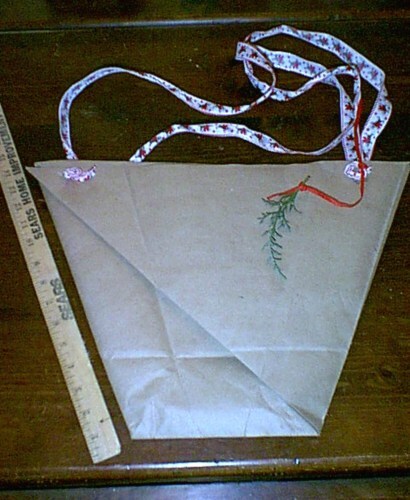 To find out where to make the fold, measure 12 inches from both sides of one corner. Fold the corner back at the 12 inch mark. Next fold the paper in half diagonally. The corners that are folded over should be on the outside. Here comes the part that makes it look like a bag. Fold one side of the bag over to the middle-- on top of the folded corner. The top edges should line up. Tuck the folded corner into the part that just got folded over it. That is about as clear as mud. Flip the bag over and do the same thing. At this point it is a bag. Find the inside of the bag, hold the layers of one side in your hand and with a hole punch, punch a hole in one corner near the top. Do this on the top corner of the two sides. These holes are for the handles. Sis made handle from 2 pieces of wired ribbon. Thread the ribbon through the hole and tie it off. She also attached a piece of greenery to one of the handles. Hopefully the image will help make this part more clear. I made this bag with kraft wrapping paper. I had a roll of it on hand. I added the glitter after the bag was finished. My sister made this bag from a large brown grocery bag. I was curious about how to make different sizes and so the information below is what I came up with. Formula for making a specific sized bag: (These are ballpark figures). The bag height that you want divided by 0.40. The answer to this is the size of the square to cut. The bag height is also the measurement (more or less) of the first fold.